The red pole on Pluto's largest moon could be remnants of the dwarf planet's escaped atmosphere. This image was taken by NASA's New Horizons spacecraft on July 13, 2015 during its historic flyby. The dark red pole on Pluto's largest moon Charon may be some of the dwarf planet's own siphoned-off atmosphere. Images and data captured by NASA's New Horizons spacecraft suggest that the reddish region at the top of the moon could be the frozen-out atmosphere from Pluto. "It looks like the pieces fit," New Horizons co-investigator Will Grundy of Lowell Observatory told Space.com. Grundy also serves as head of the surface composition theme team for New Horizons. 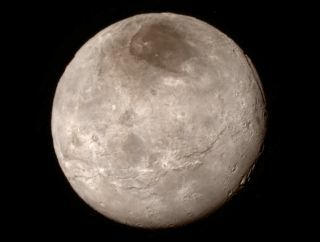 The thin, nebulous atmosphere of Pluto was detected from Earth before New Horizons reached the dwarf planet this month, but Charon showed no signs of hosting anything similar. While tiny Pluto can cling to an atmosphere for a time, it doesn't have the gravity to keep it from slowly slipping away. Pluto and Charon are similar in size, causing many scientists to refer to it as a binary planet system. As Pluto slowly releases its atmosphere, Charon may be close enough to capture it for a brief period. Although the gases from the dwarf planet would disperse evenly across the moon and fall upon the surface, the regions of the moon heated by sunlight may be too warm to allow it to freeze on the surface. Given the low gravity of the tiny moon, the atmosphere that escaped from Pluto may also escape from the smaller Charon. The material may only be capable of freezing outat the winter pole, pointed away from the sun. "Only where the dead of winter is, where it hasn't seen the sun for a long time," Randy Gladstone, New Horizons co-investigator and atmospheres team theme leader, said. In these regions, known as cold traps, the charged particles could freeze onto the surface, creating the reddish crust. As Pluto and its moons travel around the sun in its 248-Earth year orbit, Charon could continue to siphon material from its companion, freezing it onto its pole. Given the slow leakage rate of Pluto's atmosphere, Gladstone, of the Southwest Research Insitute, said back-of-the-envelope calculations performed by the team suggest the red spot could have taken about a million years to form. However, he stressed this was tentative. New Horizons revealed that Charon's surface boasted far fewer craters than anticipated, suggesting that the icy moon is being constantly resurfaced. Depending on the frequency of that process, whose source scientists remain uncertain of, Pluto's frozen-out atmosphere could have had less time to crystalize on the moon's pole before resurfacing hid all traces of the exchange. This artist's concept depicts the interaction of the solar wind with Pluto's tenuous atmosphere, which is predominantly nitrogen. Some of the molecules in the atmosphere are swept away from Pluto and escape into space. An alternate theory suggests that the darker terrain could be a geological feature, a large basin. Gladstone said the two could both be true; material from Pluto could be collecting within Charon's polar basin to form the red crust. "There are probably other theories that don't involve Pluto at all," he said. Both Grundy and Gladstone expressed their hope that the answer would not be long in coming. New Horizons collected an enormous amount of data as it flew by Plutoin the days around July 14. Ultimately, the information will take 16 monthsto come to Earth, thanks to a transmission rate slower than a dial-up Internet connection. However, one of the key signs should come out early this week, if it hasn't already landed on Earth. After the spacecraft flew by Pluto, it turned to capture the dwarf planet as it passed in front of the sun. While the bulk of the body completely blocked the light, the atmosphere around it caused a slight dimming that should allow scientists to determine its components and how thick it is. A similar observation was taken of Charon. Before New Horizons reached the Pluto system, scientists performed similar observations from Earth using a distant star. These measurements showed no atmosphere on Charon, placing an upper constraint of 1 microbar on any potential atmosphere. According to Gladstone, the observations performed by New Horizons will be able to register an atmosphere on the moon as much as 1,000 times fainter than could be detected from Earth. If Charon has an atmosphere as low as about 1 nanobar, he said the spacecraft should register it. (One bar is approximately equal to atmospheric pressure on Earth at sea level.) Gladstone hopes to see all of the results of the occultation by the end of September. Another measurement collected by the spacecraft that will help to prove or disprove the idea of a frozen captured atmosphere is the measurements of the escape rate of Pluto's atmosphere. Although this rate has been estimated in the past, New Horizons will help provide a more solid number that will help the scientists better understand and model the process. Finally, the Long Range Reconnaissance Imager (LORRI) will provide stereo images of Charon that will allow the scientists to measure the distance to the ground. This will help them to determine elevations across the planet — including at the potential northern polar basin. All of this information could show that Charon is collecting pieces of Pluto's escaping atmosphere — or it could reveal something else entirely. Both Gladstone and Grundy stressed that the idea of a frozen captured atmosphere as the source of the red spot remains tentative. Confirmed results will come over time, as the scientists review the wealth of data pouring in from the tiny spacecraft traveling beyond Pluto.